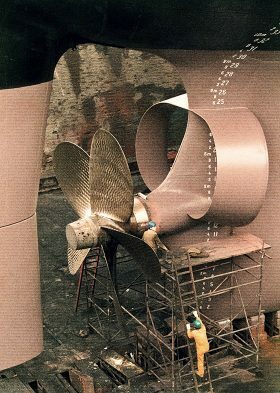 Vibrations such as may be caused by the propeller of vessels where the submerged stern has unfavourable flow characteristics create the risk of damage to the structural components and the associated connections. They diminish the passenger comfort in the form of sound, and the mediocre hydrodynamics from the arising cracks result, of course, in a performance decrease of both ocean-going and inland vessels. It is known that a certain improvement can be achieved by means of flow equalizing ducts. Measurement series from model tests and sea trials prove that additional spoilers considerably increase the efficiency when they are designed as an integral unit with the half shells at the hull. Amazing improvements are achieved by use of the wake equalizing duct, W.E.D., in combination with deflection/flow guiding fins which are also known as Grothues-Spork spoilers. The considerable impairment of the propulsion quality grade by down-flows had been underestimated in the past. More refined measuring methods then made it possible to investigate these in more detail. It was found that the downward cross-flow results from the hydrodynamic pressure differentials arising at the hull while the ship is in motion and on the basis of which the flow orientates and aligns itself in respect of velocity and direction. After successful model tests with flow guiding fins in Berlin/Germany, Japan and Norway excellent results were obtained by a combination of the Schneekluth W.E.D. with spoilers. At MARIN, the Maritime Research Institute Netherlands, fuel savings of 9.7% were recorded for current tanker newbuildings, and in the Germany-based Hamburg Ship Model Basin, HSVA, improvements at a level of 11.8% were found for E3 tankers. The Potsdam model tank establishment are of the opinion that propeller-induced pulsations are due, amongst others, to an inhomogeneous flow into the propeller. In a non-laminar turbulent flow field the angle of attack of the propeller blades changes with each angular increment. This, in turn, means that the propeller is subjected to a permanently alternating load which, inevitably, leads to the generation of vibrations. The pressure pulses propagate through the shell plating, and in certain circumstances even into the drive, but mainly pose a risk to the welded joints near the propeller and as such to the steering gear. Further, in the turbulent surrounding area the propeller cannot prop up itself powerfully in the true sense of the word. In the case of unfavourable wake conditions the engine has to deliver a higher performance for a certain speed than in the case of a wake homogenized across the entire propeller area. Designers are therefore seeking to come up with slender and flow-favourable underwater stern sections, with the objective of precluding hydrodynamic inhomogeneities from the outset. Today, this target is achieved in the majority of cases. The face of the merchant fleet, however, is not coined by newbuildings. The majority of the current stock of bulk carriers, tankers, and container vessels plough through the water with a comparatively cumbersome stern geometry and for this reason suffer losses in terms of economic efficiency (consumption and possibly also service and maintenance cost) and passenger comfort. 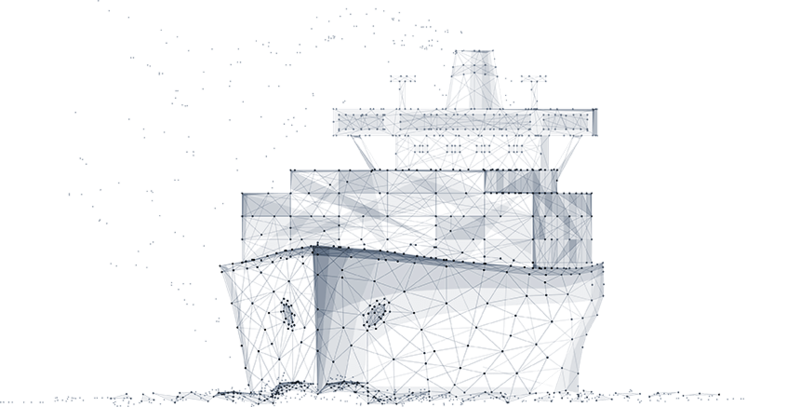 To a limited extent, the same also applies to new ships’ bodies such as in cases where the positioning of the projecting main engine at the very rear of the stern impedes optimization of the lines. It is, however, possible to absorb part of the losses by means of spoiler plates on the hull, in the inflow area to the propeller, and with a wake equalizing duct of Schneekluth type. This WED is named after its designer Prof. Dr.-Ing. Herbert Schneekluth. It is welded to the stern end of the underwater part of the ship at the port and starboard sides. From the physical point of view it consists of a hydrofoil-section venturi bent to form two half shells, where the wider opening faces the bow and the camber of the hydrofoil the vessel’s side. From this there results a negative pressure in the cross-section that draws in water, accelerates it and routes it as in channels largely homogeneously to the propeller. This channelling is assisted by matching spoiler plates. The efficiency is demonstrated by recent studies, e.g. those of Marine Engineering Consulting, Wismar, Germany, carried out with two multi-purpose cargo ships of type MPC Neptun 30 operated by the shipping company of Hermann Buss, based in Leer, Germany: A hydrodynamically oriented design and arrangement of spoilers and equalizing duct in the inflow area of the three- or multi-blade propeller reduces vibrations at a rate of 50% while achieving the same speed at a lower power input.